My Ecokids are pretty great eaters. They will gobble up just about anything I put in front of them. Luckily, I am a master of disguise! We adore eggs at our house, and if our homeowner’s association would let us, we’d have chickens in the yard. Bock-bock-bock-buh-GAWK! Chop some onion, and finely chop or chiffonade your favorite leafy green vegetable (e.g., kale, chard, spinach, beet greens, etc). Mince a clove of garlic. Heat an ovenproof skillet over medium heat, add oil, and sauté onions til soft. Add your greens and sauté for a few minutes til wilted, sprinkling with a little sea salt and freshly ground pepper. Then add garlic and sauté for one more minute. Add a little more oil to the pan, or butter if you prefer, and then add a couple of eggs. Scramble to mix it all up in the pan, then let it sit over medium/low heat. 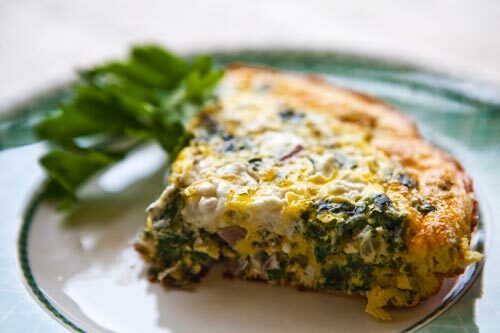 When the edges start to look cooked, sprinkle with cheese (or non-dairy cheese alternative), and pop in the oven for a few more minutes until the top of the eggs are set and solid and the cheese has melted a little. Slide it out of the pan to cool, and cut into wedges. These can also be eaten cold later as a nice, protein-rich snack. It’s amazing how two corn tortillas and some cheese can make anything taste delicious! Leftovers included! Our favorite quesadilla fillings include leftover taco meat, soy deli meats (bologna and salami flavors are Ecogirl’s favorites), or just veggies (e.g., finely chopped greens, grated raw carrots, finely diced tomatoes, etc.). Starting building your quesadilla on one of the corn tortillas, layering cheese or non-dairy cheese alternative first, then your other fillings, and a little more cheese last. Heat a small skillet over medium heat and add some oil or butter. Carefully place your loaded tortilla into the pan and leave it for a few minutes until it starts to crisp and brown on the bottom. Meanwhile, oil or butter one side of your other tortilla and place it oily side up on top of your loaded tortilla. Press down with spatula a few times, wait another minute, and then carefully flip it over. Leave it in the pan a few more minutes til the second side browns, then remove to a plate, let cool, and cut into wedges. I’m telling you: no matter what I put inside, I have yet to see any left behind on the plate! Feel free to experiment with any liquid and any fruits, but try to choose leafy green vegetables that have a very mild flavor, like spinach, chard, or even beet greens, which are actually slightly sweet. Yesterday’s smoothie was enjoyed by both Ecogirl and Ecobaby, much to my delight. Recipe below. In the blender, I added some plain kefir (liquidy, drinkable yogurt), vanilla kefir, half a banana, several frozen strawberries, and a generous handful of raw spinach leaves. I blended until thoroughly combined, poured into a fun cup with an even more fun straw, and voila: Ecogirl had the equivalent of a small spinach salad first thing in the morning, but way yummier and much more fun! And then there’s garlic. Everyone loves garlic at my house, and some veggies will actually pass the kid test sautéed with only olive oil, several cloves of minced garlic, and salt and pepper. In fact, nine times out of ten, Ecobaby will choose garlicky green beans over a sweet fruit like bananas or pears. Remember that minced garlic cooks very quickly and burns very easily, so it should be added last, for just the final minute or two of cooking time. Get a large skillet or wok nice and hot, and add some oil. Add your partly steamed veggies to the pan, and sauté for a few minutes. Add garlic, and sauté for one to two more minutes, stirring constantly. I am always experimenting with sneaky ways to hide green veggies in various foods, so stay tuned for more ideas. Meanwhile, I would love to hear some of your favorite ideas, so please leave a comment and share what works at your house! I love kale. Simply adore it. Raw, cooked, whatever. Can eat an entire bunch by myself in one sitting. And do. Often. In the Standard American Diet (SAD for short, with good reason), you usually find kale as the garnish under a platter of fruit salad. Sad indeed. Kale is a nutritional powerhouse. It’s a great source of fiber, calcium, lutein, iron, vitamins A, C, E and K. It does require a little more work from the jaws than many other greens, so it benefits from long, slow cooking, or if eaten raw, a significant amount of chopping. It’s rich in the phytochemical sulforaphane, which triggers the liver to produce enzymes that detoxify cancer-causing chemicals. A 2004 study in the Journal of Nutrition showed that sulforaphane stopped breast cancer cells in their tracks. 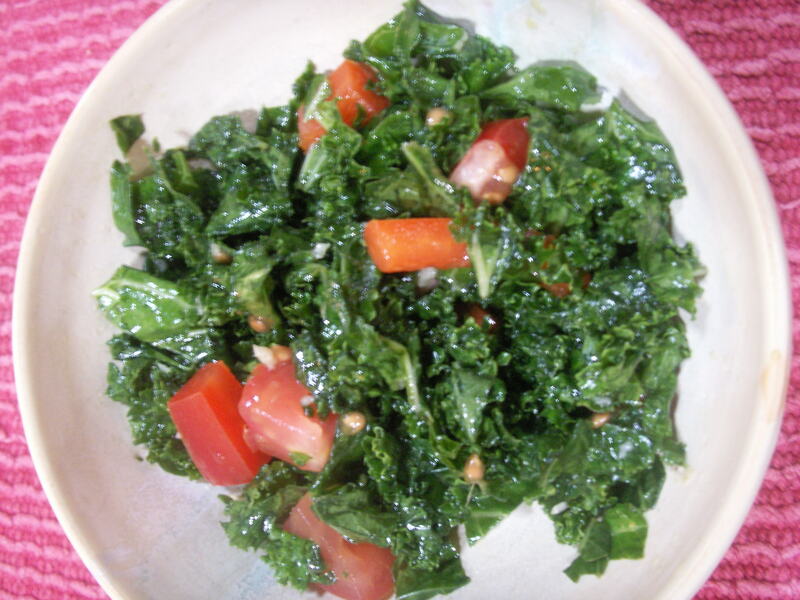 This marinated kale salad is vegan, raw, gluten-free, dairy-free, and absolutely delicious. Plus, it’s green, and by know you already know how I feel about greens! 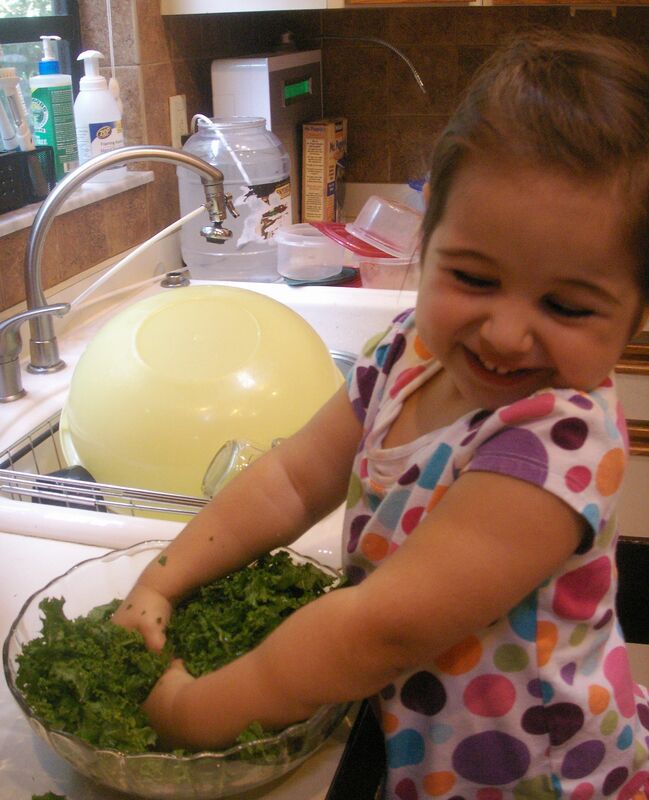 Preparation is also quite kid-friendly, as it involves “massaging” the greens with sea salt. Lots of fun for little hands. Ecogirl certainly enjoyed it! It’s one of my favorite “go-to” dishes for potlucks, and it’s even better the next day. Any chopped raw vegetables you like, such as tomato, red pepper, avocado, etc. Lots of foods in my house are green. Even ones that aren’t supposed to be. Ever had green mac ‘n’ cheese? Then you know what I’m talking about. Problem is, Ecogirl is now old enough to know that mac ‘n’ cheese is not, in fact, supposed to be green, and refuses to eat it when it is. So I have to be more stealthy with my applications of greens in her diet. One foolproof way to sneak some healthy greens into her little growing body is to hide them in a fruit smoothie. Yes, you read that right. Raw greens in a fruit smoothie. You cannot taste them. I swear. Just try it. You’ll see. Place all ingredients in blender and pulse until smooth. Did I mention how green spirulina is? Oh yes, it’s green. I mean, really really green. 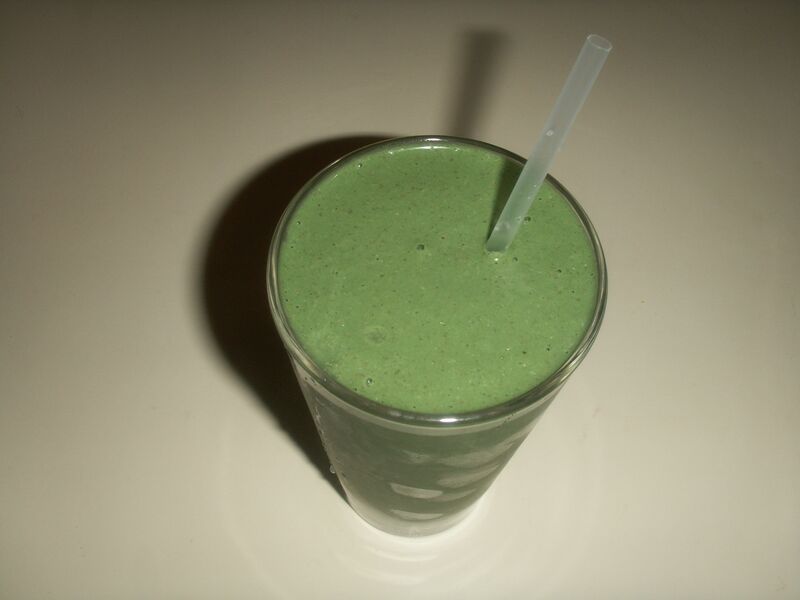 I include spirulina in every smoothie I make. Poor Ecodaddy is razzed mercilessly by his coworkers over the disturbing greenish-grey color of his smoothies. He just cheerfully gulps them down anyway because he knows how energizing and nutritious they are. Ecogirl and I love to slurp one down for a quick breakfast on those mornings when we need to get out of the house a little faster than usual. Hers is in a sippy cup, so she can’t see how green it is. Ha! Pretty sneaky, Ecomama! I’d love to hear your favorite ways to sneak some greens into your family’s diet. Please share!